This seems like a good idea, but these binder pages were meant for storing cards, not components. The photos of course will not depict this, as it only has a single page, but the thickness of the parts will mean that soon your binder will be bulging way out, or the binder will be extremely underutilized. I have a binder with reel-strips of 100 resistors taped-in and that bulges out quite a bit with only those thin components. Those tackle boxes are really the way to go. Also, it is rather difficult to remove the components from the slots. Imagine how many different parts you could fit in a Dawson's Creek Trapper Keeper Ultra Keeper Futura S 2000! no, not specifically. however, we usually keep ESD sensitive parts in their bags still and just tuck that in the pocket. Which, ironically, is not depicted in the photos. My first thought too. I'd gamble on not, but still useful. Do we get Red or White as both are shown in the pictures? It's actually just a clear pocket holder, but the 3 ring binder used is red. Sorry for the confusion! 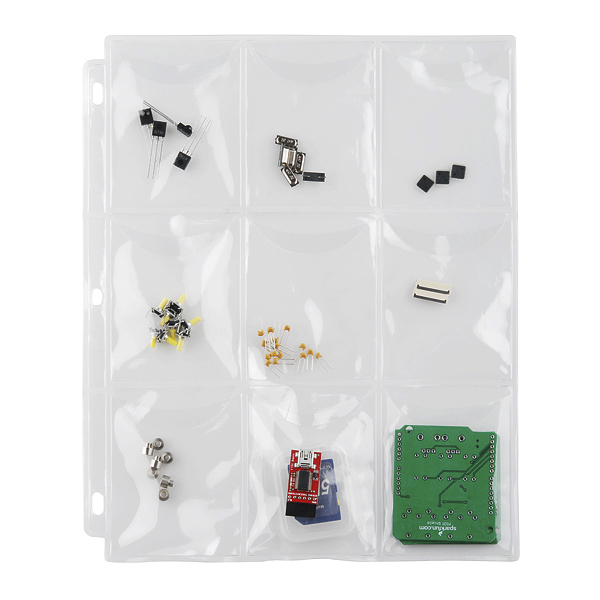 I am using these pockets to organize my resistor collection and they work great. I have 14 pages in a 2" binder, 110 different values of 1/8 Watt - over 4000 resistors total - just about fills up the binder. It can be a bit of a challenge reaching into the tiny pockets but it is far better than what I had before and way more space efficient than drawers. I can't find its "holder"...Could somebody give me its link? You can use any standard 3 ring binder for these pages. Hard to find in Italy...can you give me a link of an online store? you don't have binders in Italy? Do you have any Staples or Best-Buys in Italy? While there are undoubtedly equivalent stores in Italy, Riccardo is right in saying that 4 ring, and 2 ring, are far more common across the pond in Europe. While a search for "raccoglitore a tre anelli" will yield 3-ring binders, I wouldn't even want to readily assume that they would have the same ring spacing that the U.S. ones do. I suspect that they are (4.25" spacing), though. Just to throw something out there - if you're looking for a similar system but with metric sizes in mind, try at an Arts & Crafts store, especially those that deal with scrapbooking, people making their own greeting cards, etc. 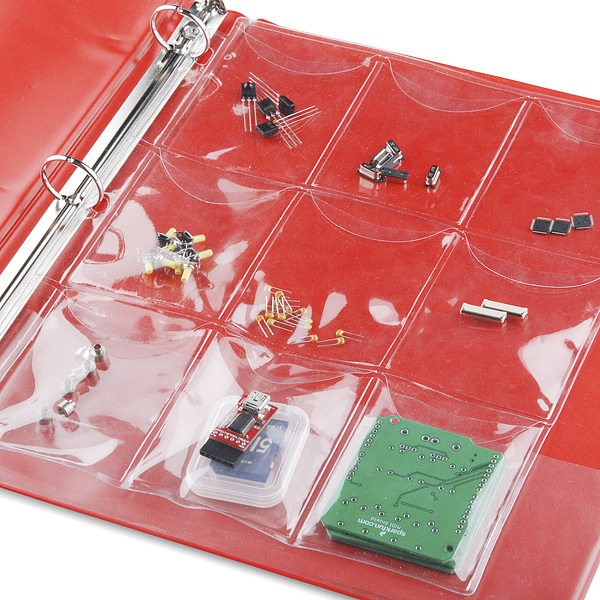 They have similar ring binder sheets that could just as easily work for electronics as they do for beads, appliques, etc. For SMT components I assume it would be just fine to keep them in their packaging (I usually order cut-tape) for the purposes of ESD protection, yeah? Or better yet do that and give the pages a nice wipe down with ESD-prevention spray. 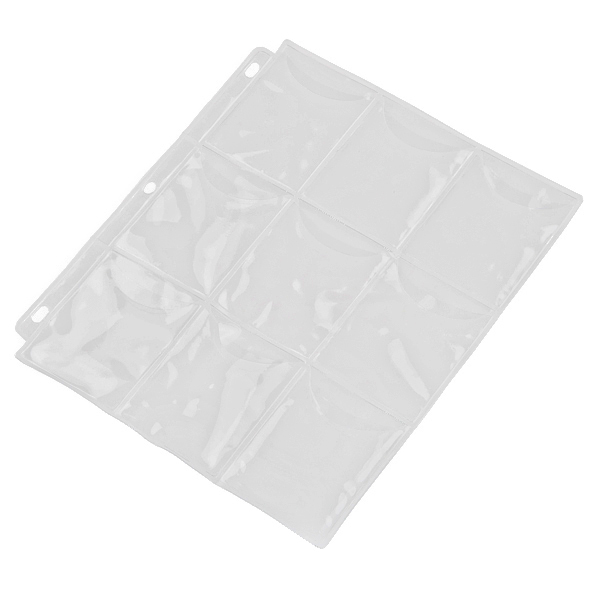 I suppose for ESD parts you could place them in a small anti-static bag and then place that bag into the pockets of these sheets. I'm Now crazy organized thanks to only about 10 of these. Everything is mega easy to find and it's easier to keep track of what I'm going to need.